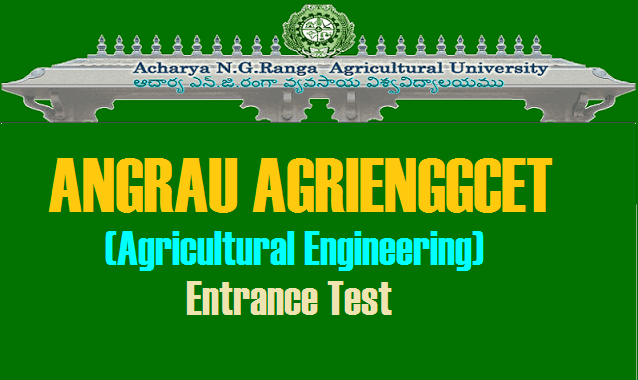 ANGRAU AGRIENGGCET 2018/Agricultural Engineering Common Entrance Test 2018 Notification/B.Tech Agricultural Engineering Degree Course Admissions 2018: Acharya N.G. Ranga Agricultural University, Andhra Pradesh state has released the AGRIENGGCET 2018 notification on May, 13th 2018 and ANGRAU/Acharya N.G. 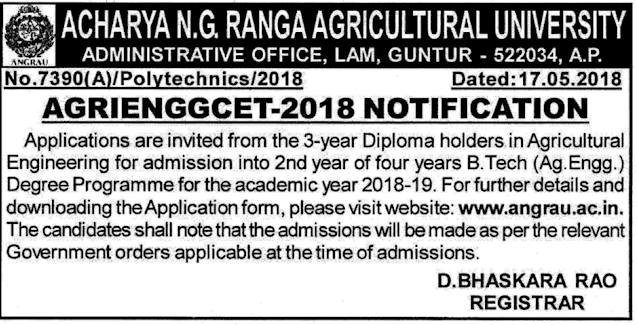 Ranga Agricultural University invites the online application forms/prescribed application forms from Diploma holders in Agricultural Engineering for admission into 2nd year of four years B.Tech.(Ag.Engg.) Degree Programme through AGRIENGGCET 2018 for the academic year 2018 -2019. Agricultural Engineering Entrance Test 2018 Notification, Online Application Form, Last date, exam date, hall tickets, results, counselling dates details given here.. Admissions will be made strictly as per the rule of reservation based on merit through the Entrance Test in English. The AGRIENGGCET 2018 will consist of only 150 (One Hundred and Fifty only) Multiple Choice Objective Type Questions and the candidates shall have to answer in answer sheet. The Test will be conducted at College of Agricultural Engineering, Bapatla on from 10.00 AM to 12.00 Noon.